A hiatal hernia occurs when a portion of the stomach prolapses through the diaphragmatic esophageal hiatus. Most hiatal hernias are asymptomatic and are discovered incidentally, but rarely, a life-threatening complication may present acutely. The image below depicts a paraesophageal hiatal hernia. A paraesophageal hernia is seen on an upper gastrointestinal series. Note that the gastroesophageal junction remains below the diaphragm. Courtesy of David Y. Graham, MD. Most people with hiatal hernias are asymptomatic. In a minority of individuals, hiatal hernias may predispose to reflux or worsen existing reflux. Diaphragmatic hernias may be congenital or acquired. Acquired hiatal hernias are divided further into nontraumatic (more common) and traumatic hernias. Nontraumatically acquired hernias are divided yet further into 2 types: (1) sliding hiatal hernia and (2) paraesophageal hiatal hernia (a mixed variety is also possible). The typical reason for evaluation is the presence of symptoms of gastroesophageal reflux disease (GERD) or a chest radiograph suggesting a paraesophageal hernia. A barium study also helps distinguish a sliding from a paraesophageal hernia. A hiatal hernia occurs when a portion of the stomach prolapses through the diaphragmatic esophageal hiatus. Although the existence of hiatal hernia has been described in earlier medical literature, it has come under scrutiny only in the last century or so because of its association with gastroesophageal reflux disease (GERD) and its complications. There is also an association between obesity and the presence of hiatal hernia. By far, most hiatal hernias are asymptomatic and are discovered incidentally. On rare occasion, a life-threatening complication, such as gastric volvulus or strangulation, may present acutely. The lower esophageal sphincter (LES) is an area of smooth muscle approximately 2.5-4.5 cm in length. The upper part of the sphincter normally lies within the diaphragmatic hiatus, while the lower section normally is intra-abdominal. At this level, the visceral peritoneum and the phrenoesophageal ligament cover the esophagus. The phrenoesophageal ligament is a fibrous layer of connective tissue arising from the crura, and it maintains the LES within the abdominal cavity. The A-ring is an indentation sometimes seen on barium studies, and it marks the upper part of the LES. Just below this is a slightly dilated part of the esophagus, forming the vestibule. A second ring, the B-ring, may be seen just distal to the vestibule, and it approximates the Z-line or squamocolumnar junction. The presence of a B-ring confirms the diagnosis of a hiatal hernia. Occasionally, the B-ring also is called the Schatzki ring. Any sudden increase in intra-abdominal pressure also acts on the portion of the LES below the diaphragm to increase the sphincter pressure. An acute angle, the angle of His, is formed between the cardia of the stomach and the distal esophagus and functions as a flap at the gastroesophageal junction and helps prevent reflux of gastric contents into the esophagus (see the image below). Hiatal hernia. Figure 1 shows the normal relationship of the gastroesophageal junction, stomach, esophagus, and diaphragm. Figure 2 shows a sliding hiatal hernia where the stomach immediately below the gastroesophageal junction is seen to prolapse through the diaphragmatic hiatus into the chest. Figure 3 shows a paraesophageal hernia in which the cardia or fundus of the stomach prolapses through the diaphragmatic hiatus, leaving the gastroesophageal junction within the esophageal cavity. The gastroesophageal junction acts as a barrier to prevent reflux of contents from the stomach into the esophagus by a combination of mechanisms forming the antireflux barrier. The components of this barrier include the diaphragmatic crura, the LES baseline pressure and intra-abdominal segment, and the angle of His. The presence of a hiatal hernia compromises this reflux barrier not only in terms of reduced LES pressure but also reduced esophageal acid clearance. Patients with hiatal hernias also have longer transient LES relaxation episodes particularly at night time. These factors increase the esophageal mucosa acid contact time predisposing to esophagitis and related complications. Hiatal hernias are more common in Western countries. The frequency of hiatus hernia increases with age, from 10% in patients younger than 40 years to 70% in patients older than 70 years. Sihvo et al examined the mortality associated with adult paraesophageal hernia in a Finnish retrospective, population-based study. Five hundred sixty-three patients received surgical intervention and 67 received conservative treatment for paraesophageal hernia. Death occurred in 32 patients, of whom 29 had concomitant diseases. In a Swiss study, Larusson et al investigated the predictive factors for postoperative morbidity and mortality in patients undergoing laparoscopic hernia repair. Of 354 laparoscopic paraesophageal hernia repairs, age at 70 years or older was significantly associated with postoperative morbidity (24.4%) and mortality (2.4%) relative to those younger than 70 years (10.1% postoperative morbidity, P = 0.001; 0% mortality, P = 0.045). Similar age findings were noted with gastropexy but not with fundoplication. In addition, high-risk patients had significantly higher morbidity but not mortality. 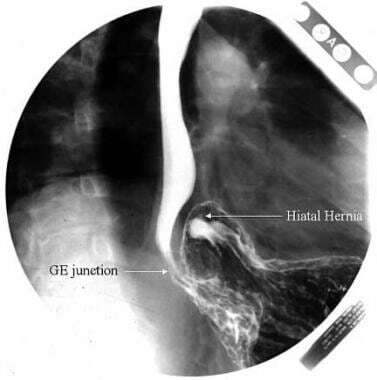 Hiatal hernias are more common in women than in men. This might relate to the intra-abdominal forces exerted in pregnancy. Muscle weakening and loss of elasticity as people age is thought to predispose to hiatus hernia, based on the increasing prevalence in older people. With decreasing tissue elasticity, the gastric cardia may not return to its normal position below the diaphragmatic hiatus following a normal swallow. Loss of muscle tone around the diaphragmatic opening also may make it more patulous. Polomsky M, Peters JH, Schwartz SI. Hiatal hernia and disorders of the spine: a historical perspective. Dis Esophagus. 2011 Oct 25. [Medline]. Burkitt DP, James PA. Low-residue diets and hiatus hernia. Lancet. 1973 Jul 21. 2(7821):128-30. [Medline]. Sihvo EI, Salo JA, Rasanen JV, Rantanen TK. Fatal complications of adult paraesophageal hernia: a population-based study. J Thorac Cardiovasc Surg. 2009 Feb. 137(2):419-24. [Medline]. Larusson HJ, Zingg U, Hahnloser D, Delport K, Seifert B, Oertli D. Predictive factors for morbidity and mortality in patients undergoing laparoscopic paraesophageal hernia repair: age, ASA score and operation type influence morbidity. World J Surg. 2009 May. 33(5):980-5. [Medline]. Fernandez Mdel C, Diaz M, Lopez F, Marti-Obiol R, Ortega J. Cardiac complications after laparoscopic large hiatal hernia repair. Is it related with staple fixation of the mesh? -Report of three cases. Ann Med Surg (Lond). 2015 Dec. 4 (4):395-8. [Medline]. Salvador R, Dubecz A, Polomsky M, Gellerson O, Jones CE, Raymond DP, et al. A new era in esophageal diagnostics: the image-based paradigm of high-resolution manometry. J Am Coll Surg. 2009 Jun. 208(6):1035-44. [Medline]. Weijenborg PW, van Hoeij FB, Smout AJ, Bredenoord AJ. Accuracy of hiatal hernia detection with esophageal high-resolution manometry. Neurogastroenterol Motil. 2015 Feb. 27 (2):293-9. [Medline]. Barclay L. Hiatal hernia management guidelines issued. Medscape Medical News. June 24, 2013;. Available at http://www.medscape.com/viewarticle/806792. Accessed: October 21, 2014. Kohn GP, Price RR, Demeester SR, et al. Guidelines for the management of hiatal hernia. Available at http://www.sages.org/publications/guidelines/guidelines-for-the-management-of-hiatal-hernia/. Accessed: October 21, 2014. Hazebroek EJ, Leibman S, Smith GS. Erosion of a composite PTFE/ePTFE mesh after hiatal hernia repair. Surg Laparosc Endosc Percutan Tech. 2009 Apr. 19(2):175-7. [Medline]. Soricelli E, Basso N, Genco A, Cipriano M. Long-term results of hiatal hernia mesh repair and antireflux laparoscopic surgery. Surg Endosc. 2009 Apr 3. [Medline]. Wassenaar EB, Mier F, Sinan H, Petersen RP, Martin AV, Pellegrini CA, et al. The safety of biologic mesh for laparoscopic repair of large, complicated hiatal hernia. Surg Endosc. 2011 Nov 16. [Medline]. Diaz DF, Roth JS. Laparoscopic paraesophageal hernia repair with acellular dermal matrix cruroplasty. JSLS. 2011 Jul-Sep. 15(3):355-60. [Medline]. [Full Text]. Memon MA, Memon B, Yunus RM, Khan S. Suture cruroplasty versus prosthetic hiatal herniorrhaphy for large hiatal hernia: a meta-analysis and systematic review of randomized controlled trials. Ann Surg. 2015 Oct 1. [Medline]. Lugaresi M, Mattioli B, Perrone O, Daddi N, Di Simone MP, Mattioli S. Results of left thoracoscopic Collis gastroplasty with laparoscopic Nissen fundoplication for the surgical treatment of true short oesophagus in gastro-oesophageal reflux disease and Type III-IV hiatal hernia. Eur J Cardiothorac Surg. 2016 Jan. 49 (1):e22-30. [Medline]. Tam V, Winger DG, Nason KS. A systematic review and meta-analysis of mesh vs suture cruroplasty in laparoscopic large hiatal hernia repair. Am J Surg. 2016 Jan. 211 (1):226-38. [Medline]. Wennergren J, Levy S, Bower C, et al. Revisional paraesophageal hernia repair outcomes compare favorably to initial operations. Surg Endosc. 2015 Dec 10. [Medline]. DeMeester TR, Peters JH. Surgical treatment of gastroesophageal reflux disease. In: DO Castell, ed. The Esophagus. Boston, Mass:. Little, Brown and Company. 1995:577-617. Frantzides CT, Madan AK, Carlson MA, Zeni TM, Zografakis JG, Moore RM, et al. Laparoscopic revision of failed fundoplication and hiatal herniorraphy. J Laparoendosc Adv Surg Tech A. 2009 Apr. 19(2):135-9. [Medline]. Cai W, Watson DI, Lally CJ, Devitt PG, Game PA, Jamieson GG. Ten-year clinical outcome of a prospective randomized clinical trial of laparoscopic Nissen versus anterior 180( degrees ) partial fundoplication. Br J Surg. 2008 Dec. 95(12):1501-5. [Medline]. Petersen LF, McChesney SL, Daly SC, et al. Permanent mesh results in long-term symptom improvement and patient satisfaction without increasing adverse outcomes in hiatal hernia repair. Am J Surg. 2014 Mar. 207(3):445-8; discussion 448. [Medline]. Hashmi S, Rao SS, Summers RW, Schulze K. Esophageal pressure topography, body position, and hiatal hernia. J Clin Gastroenterol. 2014 Mar. 48 (3):224-30. [Medline]. Anteroposterior (left and lateral views (right) on a chest radiograph showing a large hiatal hernia. Courtesy of David Y. Graham, MD. Barium study shows a sliding hiatal hernia: The gastric folds can be seen extending above the diaphragm. Courtesy of David Y. Graham, MD. Paraesophageal hernia is seen on barium upper gastrointestinal series. The mucosal folds are seen going up into the chest, next to the esophagus. Courtesy of David Y. Graham, MD. Barium radiograph view of a large paraesophageal hernia. Courtesy of David Y. Graham, MD. A large paraesophageal hernia in which the entire stomach is seen in the chest cavity. Courtesy of David Y. Graham, MD. Barium studies show gastric volvulus as the herniated stomach undergoes rotation. This situation requires surgical intervention. Courtesy of David Y. Graham, MD. A retrograde view of a hiatal hernia seen at endoscopy shows the gastric folds to the left of the scope shaft extending up into the hernia. Courtesy of David Y. Graham, MD. Inderpal S. Sarkaria, MD, discusses the options for paraesophageal hernia repair. Courtesy of Memorial Sloan-Kettering Cancer Center.